all off, my computer monitor died..... just got back online today. down all you snow birds..
Wow, WAPA is nearing my house to turn on the power. Hooray! I will be happy to get off the generators. I was downtown and it looked about the same. Curfew has been lifted to 10:00 pm. 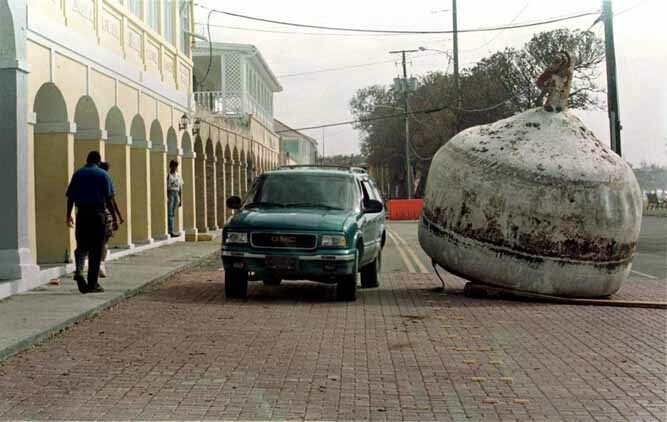 Tomorrow it will be lifted so that we can all go to Harbor Night for a big street party in Frederiksted. Trish is going fishing with the Mile Mark boys and says that they are going to slam some Wahoo or tuna so we can have a sushi party. Now the meeting ground was Solitude Store and everyone was parked there watching WAPA (Water and Power Authority) guys work. They looked like angles up there on the cherry picker and they handled the cheers well. They are working around the clock. My office was in full force today. Trish was showing property. Things were so normal. Tennis tomorrow--yeah! Thank you all for your kind e-mails. I appreciate your support and I have passed on your encouragement to everyone I meet. I am completely impressed with the state of the island only a few days after a near miss by a CAT4-5 hurricane. The cleanup is proceeding extremely fast. Power is on in many areas and I believe the St. Croix public works folks should be commended for the cleanup work. Harbor night is on for Wednesday and the curfew is scheduled to be listed for the Carnival Destiny. Hat's off to the radio stations (Senator Redfield), Public Works, Vitelco, HOVENSA, and WAPA. Even though I don't have electricity or telephone, I know many people who do. Everyone who lives on St. Croix should be proud of their island.....we'll back back to normal before you know it!!! Well, I am back at work and taking my lunch break as I write this. Had to go down to the Hardware store (again) for an extension cord so I don't have to move the generator over to the pool pump. I had to get a 9 Volt battery so that I can get my answering machine up. I then found out that I get one little beep to let me know that someone is calling and the answering machine can't pick it up with just one little beep. While I was at the Hardware store, I got lots of hugs from all the guys I know. Some still have their Don Johnson look and good thing that they all had baths (smile). Anyway, the hugs were really nice and they were a lot of help with what I needed. Escorted me right to the batteries....to the extension cord... I sure appreciated all their help. The phrase of the day was "How did you do?" Everyone said okay, just a little water or lost a few trees or "I got cable, power and telephone! Do you??" Now over at the post office: I was sent by my secretary to mail out I survived Lenny T shirts out to her family (who by the way was in Maine the whole time...) My brother, Wayne, wanted to know if I wanted to come back to the States. My dad and my sister knew better than to ask... Why would I leave? I live in paradise, have had 2 bad days since 1996, earn a living in paradise, have great friends, good weather 99% of the time and get hugs in the hardware store and post office. At the post office, my ex-personal trainer, Mark told me that his live aboard sailboat had some damage but he will be able to fix it with a little bit of money and he then opened an envelope with a check in for the amount he told me that it would cost him. You should have seen his eyes get wide. I got one hug before the envelope was opened and then two afterwards. I was happy for him. It is such a beautiful day and the ocean is so bright blue. Gorgeous. The winds are so gentle. People are getting down to their routine. We are not down or out. We have a gorgeous island and great people. Come on down! The curfew is lifted for Wednesday night. I hope everyone plans to show their support by going to Harbor Night. I will be there with my friend Trish. You can't miss her as she plans to wear a dress that looks like the 4th of July. It is worth it to come down to Frederiksted just to see her in that dress! You won't be able to miss us--two blondes. I haven't picked out my Harbor night outfit yet but I can tell you working out 3 times a week, playing tennis and trying to play golf does have it's benefits. The Chick Magnet also know as Donnie was by to fix my landscape with Jose. Donnie is my regular lawn guy. I think I am his only landscape customer now that he is Stone Mason Man. I was his only customer for awhile there when he got started and I got him new clients so there is loyalty there. Donnie has been working over at the Divi and he said that word was put out that they needed workers to pick up debris and 46 people showed up and got everything done in a matter of a few hours. Bob from Detroit came down just hours before the hurricane hit and now he has a job and is staying. What does that tell you? He said he couldn't believe how great the people were, how fast the island recovered and how beautiful it was just after the hurricane. He said you wouldn't believe your eyes that St. Croix was hit by a hurricane. There is still work to do but we are all pitching in to do what needs to be done. When someone comes to visit, you just keep doing what you were doing and they help. Then you go to their house to help them. It is fun. Helped Trish put up twinkle lights on her patio, do laundry and then had fun when it got dark. Andrea stopped by to re-charge her cell phone and add minutes. Bunch of people showed up for lunch as they knew I would be bar-q-ing and making my grandfather's camp fire potatoes and onions. Everyone got in the pool because the sun was hot and the breeze slow and we floated on the noodles. My hair salon is open for business and taking appointments. I have an appointment Tuesday--you know I have to be ready for Harbor Night. My tennis and golf are still on at the Buccaneer this week. People are doing their usual morning walk. My trainer will be by tomorrow. My telephone doesn't ring so I think I have figured out a way using the answering machine to let me know someone has called. I have extension cords everywhere from the generators to the electrical appliances--orange and green cords really enhance the decor (smile). The radio station is playing music instead of the hurricane reporting. I have to give Wes Small, Senator Redfield and everyone down at 104.9 a big thank you. They helped everyone by getting out information, help and support to us when we needed it. They were away from their families and I would like to thank the families of all the people whose loved one was out there because of this emergency. You all should be commended. Gen. James Jones and his family and friends stayed down through the hurricane. Everyone was all out working to help the community. Thank you to the Marines and their family. Harold, Miles, Trish and I made sushi at their rented villa and I brough leftovers from a Women's Networking pool party earlier that day and I was able to make my accquaintance with the 4 and 2 star generals and their families. What an honorable group of men and women. I was impressed by the men who are in charge of the Marine Corps. I received an e-mail from my good friend, Capt. Jan van der Burg, of the Royal Netherlands Navy who told me that they went to St. Martin and Saba to help their citizens. Capt. Jan was very concerned about our condition here on island and sent his prays and good wishes to us all on St. Croix. Evidently they were in a lot worse shape that we were. My prayers and best wishes go out all the other islands and people that was affected by Hurricane Lenny. Oh, I have already seen some drawings of the Hurricane Lenny bracelets. I am going into town on Tuesday to take a good look at them and ponder which one would look good on my arm. Trish and I are chomping at the bit to see what the jewelers have come up with. Don't worry guys, you can have one because they always have a masculine version of the bracelet. I am lucking out because they all have something with an L--either laying on it side, a stylized version or something. What about just a big L for Linda? oh, I mean Lenny.... Since it is a Cat. 5 hurricane, Trish says that we should consider the earrings and pendant. Project St. Croix still needs your donantions. There is still things that have to be done to restore the island and we could use your help. Please come down and see us and our wonderful island. Some pictures I received from John Sullivan <jsulliva AT freepress.mb.ca>. planes in or out yet. - Party time and Update! We had a great party time at Cheeseburgers in Paradise---now that's where the East End went to meet and greet. Jeez, some stories were funny. Everyone checked in and looked good. When the beer truck arrived everyone knew it surely was business as usual. 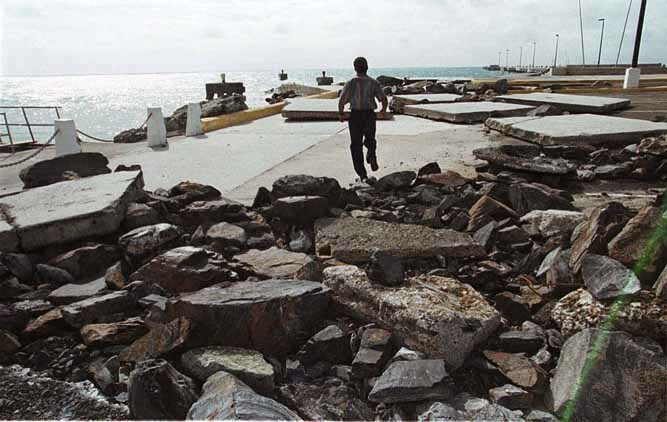 Jerry Smith went out to Frederiksted to check out the damage. This is his report: Pier stuctually is intact and it appears to be able to receive cruise ships. We lost the pretty covered area where you sit and watch the ocean. He didn't see any serious damage in the downtown area. There was sand but the poles all looked okay. There was some kind of thing that the ship attach to (this is the best I could get from a non-sailor) that was washed up. It looks like it was set there with a crane. There was some water damage but nothing that would stop tourists from coming. Bob from Detroit said that you couldn't tell there had been a hurricane except for the "pruning job" on the vegetation. Jerry says that this is no worse than an ice storm in North Mississippi or what a couple of good drunks could do on a Saturday night. He says his house looks like a barn inside and he knows barns. There are so many animal tracks in his house, I thought I was in a zoo. The cat have put sand in his bed. He better have this house back in order before Sherry comes back. Donations to Project St. Croix are being pledged. Thank you and keep them coming. See my previous reports. The poor Yacht Club. The building is fine but the boats took a beating. If you had pre-sunk the boat you were okay. These are my friends and it is sad when they see their boat. Doc's 36' catamaran survived. The Yacht Club will be up and running soon as they are smart and motivated. Please keep letting the world know about the conditions here. We want the truth out about St. Croix. Please send the news media this information. Buccaneer appeared to be fully functional. They gave complimentary dinner and breakfast to their guest. A class act over there. Jerry spoke with the FEMA and they appeared to be impressed with the lack of damage to St. Croix. Being prepared really made a difference to everyone. Bob had a great time along with Trish, Rob, Andrea, Scott (still smelling like apples), Jeff and everyone else. They even had live music to sing along with. We are smiling in paradise. - Reports from the Gang! Trish says that the VITAR buses are running and Baggys Two Eatery is open. My new housing developer client from the states was trying to get a reduced retainer by skimming the pool top for leaves. No deal because he really just wanted to use the pool himself. He was here and he is still going through with the development so that should tell you that he was impressed by our resiliency. Cape Air is flying. They are great people and are new to the island. They are flying inter-island. The TV show Wings was based on this airline out of Nantucket. Michelle, the office manager, is wonderful. HOVENSA comes through for St. Croix once again. When in need, HOVENSA (formerly known as Amarada Hess), has always been there for the people of St. Croix. 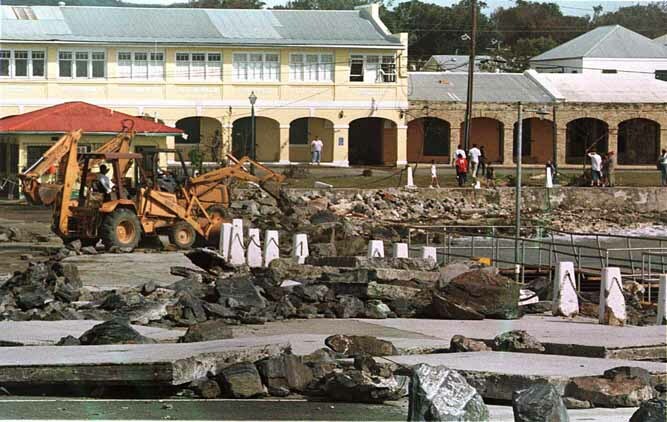 They have agreed to repair the Cruise Ship dock in Frederiksted so that it will be open for business for the Destiny on Wednesday. Thank you HOVENSA!!! The owners and employees of HOVENSA really care. HARBOR NIGHT, a big street party in Frederiksted, with vendors, bands, Mocko Jumbie dancers will take place as usual to great the cruise ship. What fun! We won't be stopped. PROJECT ST. CROIX, P.O. Box 3045, Christiansted, VI 00822, a 501(c) (3) NON-PROFIT CHARITABLE ORGANIZATION is asking for donations to help rebuild the boardwalk. If you would like to send donations that you would like to be used to fix it, please ear mark your checks board walk. If you wish to make a general donation, that would be greatly appreciated. Project St. Croix is involved with Community awareness, the Triatholon, K-9 Police Dogs and other projects. JEFFREY PROSSER and VITELCO are to be commended in their foresight to run a lot of cables underground. JEFFREY PROSSER, his wife, DAWN, and the rest of his family has been there for St. Croix with their generosity and help. VITELCO sponsored the St. Croix Regatta this year. Helped out with the plane load of emissaries to Tim Duncan's (our native son) victory in St. Antonio for the Basketball playoffs and many more things. Thank you VITELCO and Thank you to the Prosser family. Also, a good friend to this island is MARINE CORPS COMMANDANT GENERAL JAMES JONES. Saturday, the Marine Corps celebrated its 224th Birthday with a touching cake cutting ceremony at Fort Christianvern in Christiansted. Gen. Jones has dispatched a team of 30 to 40 Marines for special projects to be supervised by Mark Sperber who is part of Project St. Croix. According to Mark Sperber of Mile Mark Watersports, they will be up and running on Monday ready for cruise ship and any other business. He said Buck Island is beautiful and to "Come on down, the island is fine---you have my personal guarantee." Mark said the King Christian hotel had no damage. He heard a report that 40% of the power was up and running within 48 hours of almost a Cat 5 Hurricane. He said that the Governer must declare a state of emergency to have curfew and receive Federal Funds for quickly restoring the island. There has been no looting, deaths and everything is fine. Newsweek ran a cover according to my stateside friends showing the Yacht Club dock a mess. It is suppose to be a mess with all the boards off so that the pilings stay intact and the boards --the cheapest part of the dock-- can be scooped up and replaced. The boards are numbered so that they can be re-fit. This is the way a dock is suppose to be engineered. Too bad that only a negative photo reached Newsweek, not one of us having a pool party and bar-b-que by candlelight. I am asking everyone that could reach a news agency to send my reports to them. We are a resort area which survived a Hurricane Cat. 4 or 5 with flying colors and that is the message that should go out, not the negative one all the time. It only scares family and friends and ruins businesses unnecessarily when only the bad, not the good is represented. Barb Robbins and her 5 year old daughter, Michelle, came by. I was curious as to Michelle's version of a hurricane was and this is what she said: "Leave us alone, Lenny" ---that was her mantra. She said that "Sunset the kitty was very playful during the storm." She played with other kids yesterday and that they had a good storm and good time. Barb is my personal trainer and when I saw her at the door, I thought, "Yes, I can work out today!" and then I thought, "No, I don't want to work out today"--thank goodness she was just checking on me because we are friends. Her husband's business installed my wonderful hurricane shutters and cable tie downs on my house and shed. Barb said that the radio said that almost all feeders are working and that WAPA is working on the lateral lines. WAPA expects to be almost at full power soon. Hey, WAPA, how about putting those lines underground?? We need some Federal funds to assist us as it will be cheaper on FEMA in the long run. Donnie (a/k/a Stoneworks---Masonry and Waterfall builder, a/k/a (to me) as Eldon ala Murphy Brown; a/k/a The Chick Magnet) came by to check on the waterfall, a surprise housewarming present from Donnie and Miles Sperber. Donnie said that all the stonework he did at Divi and every where else held up. The hotel is up and running and the casino is under construction anyway and they are going to keep going. Can't wait for the casino to open! Donnie told me that he, Harold Blunk, Miles and Mark were so bored during the hurricane that they started to remodel the kitchen up at Miles and Mark's House called "The Compond". During the Hurricane, I read Jimmy Buffet's book, "A Pirate Turns 50", did my nails, slept, ate chocolate muffins, ate lasagna, talked to my friends and family. I did have thoughts about re-designing my kitchen, too. I wonder if Hurricanes increase the work for carpenters because the women are at home thinking about re-designing the kitchen?? To all of you that have e-mailed me and thanked me for these reports. I appreciate the encouragement. I take this very seriously because I believe that you deserve the truth as we know it. I also have tried to reach everyone that you have requested but I have not been able to get through as the telephone line is busy. John Luce--someone said your slab looked okay and that you should come on down and finish your house so that you can live in paradise with the rest of us. Dr. Van Heckmann--your house is okay. Well, I have to go get some more gas and get back to work. PepperTree Terrace, a manufactured home park near the Hospital mid island is very good shape. Estate Diamond and Ruby, Gunther Village is okay. No Bones Cafe in Gallows Bay was serving lunch and she said the Veal Parmesean was excellent. Tomas is a good chef. They were playing golf with golf carts at the Buccaneer Hotel. American Airlines are flying their regular routes. Delta is now coming in on Saturday. RE/MAX is opened for business as usual and her customers are buying or looking. Report from resident of Rainforest that everything was fine at his house. Plantation Condos in Southgate is fine. St. Croix by the Sea Condo is looking fine from her view from the outside. Government House is in great shape downtown Christiansted. No reported deaths according to the radio and word on island. WAPA was restoring power to Gallows Bay. Sierra Verde is great except that up to the top of "W" mountain there are some snapped poles. Cotton Valley Shores and beach came through okay. There is very little debris on island. K-Mart (both) are open. Cost-U- Less is open. Plaza Extra, Pueblo and the smaller grocery stores are open and stocked. Miles and Mark Sperber, owners of Mile Mark Watersports and their crew have begun rebuilding the damage to the boardwalk. This boardwalk is owned by the government and they are spear heading the repair. They need donations of lumber and supplies. Please call Mark 690-5444 to see how you can help. Tell him Trish sent you. We would like to commend and thank the workers at WAPA and VITELCO for all their efforts. Could someone tell them that I am without power and two lines here in Cotton Valley? My computer system is almost done. Wow, it is really nice. My assistant, Andrea, will be at work on Monday and we will be business as usual for Wills, Trust, Real Estate and Corporate. I just received a call from my good friend in Chicago and she said the reports are horrible. What island are they talking about?? My friend from St. Thomas reported all things well over there and that the reporting was a joke. Why not report what is true and good? Like the spirit, care and concern for others. Our island is a wonderful place to live and visit. We have wonderful sights, shops and things to do. It is beautiful. Everyone who ever comes here to visit me always wants to come back. Thank you for all the e-mail, prayers and good wishes. I have passed them on. Christiansted is open for business. All the banks were open. The hardware store seems to be the meeting place of today. One thing I noticed is that the men are taking this opportunity to sport the "Don Johnson" look. The ladies all had their lipstick on though. The video stores, gas stations and grocery stores were open. American Airlines is flying in and out starting at noon including the jet to Miami. Jerry got Radio Shack open. My legal office is open and we are taking the time to install a new computer system. Not many calls today for Estate Planning, real estate or corporate issues. I need some help getting the trees up righted in my yard and hopefully someone will show up. (Hopefully, a couple of handsome single men will show up). Kathy showed up to hose down her and my car because she said salt water will damage the finish. She needed a shower, too. She also needs my deoderant. She almost sprayed her armpits with my hair spray. Ever since Kathy flipped over her car a couple a times a few months ago, we have all been wondering about her. She does have a good sense of humor because she is not hitting the backspace button to erase this. Scott has a new job---sweeper of the year. Kathy left him at her house sweeping dirt while she took a shower. Next thing you know, Scott will be showing up for a shower. Good thing the cistern is full. It is sunny and a bit muggy. The pool looks fantastic. The computer guy is sweeping off the leaves that blew in because he said he is hot and wants to take a dip. Did I mention my office is off my home? St. Croix is truly a relaxed kind of place, wouldn't you say? The Yacht club lost the boards on the dock again. They are numbered and they get picked up and put back. Rumor has it that they are meant to come off leaving the pilings. Boats came ashore and there was some damaged. Divi Casino was damaged but the hotel is still running. Schools will be open on Monday. Students and faculty are cleaning up the debris. Cheeseburgers bar is open and it appears so is every other bar on this island. 140 mph with sustained winds of 120 mph. leaves out of the house. We were lucky. was destroyed. Some boats were sunk, some others were washed on shore. is in effect from 4:00 PM till 7:00 AM until further notice. I'll report back if any more news becomes available.